Waffles made with yeast are a great alternative to traditional waffles. 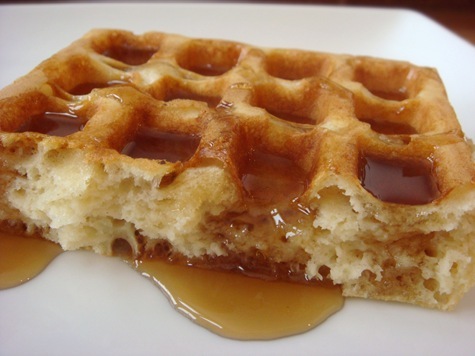 They have a slightly tangy flavor and are much lighter than many regular waffle recipes. Yeast raised waffles do require some forethought, as the batter needs to be made the night before, and left to proof on the countertop overnight. Be sure to use a big bowl as the batter will rise significantly. Whisk the flour, sugar, yeast and salt together in a large bowl, then gradually whisk in the warm milk and melted butter until smooth. Whisk in the eggs and vanilla until combined. Scrape down the sides of the bowl, cover with plastic wrap, and refrigerate for at least 12 hours or up to 24 hours. Heat the waffle iron according to the manufacturer’s instruction. Spread the appropriate amount of batter (I use a scant 2 cups in mine) onto the waffle iron and cook until golden brown, about 3-4 minutes. **Use less batter than you normally do: this batter rises significantly while cooking.